I’ve been kind of quiet about Lent and temptation and giving up something this year. After last year’s rather ambitious blog series of Lenten meditations, I decided to keep a less stressful and quiet Lent this year and just give up chocolate and Facebook on Sundays. A sacrifice for sure, but not as big of a sacrifice for me as say, coffee or completely giving up Facebook. Or bread (one of my daughters loves bread so much she gave that up one year). But bigger than say, giving up Brussels sprouts, which I like, but hardly ever make. Or giving up a smart phone, which I do not own. Then yesterday, one of my worst devils sneaked into the breakroom at my office and sat there sneering at me. 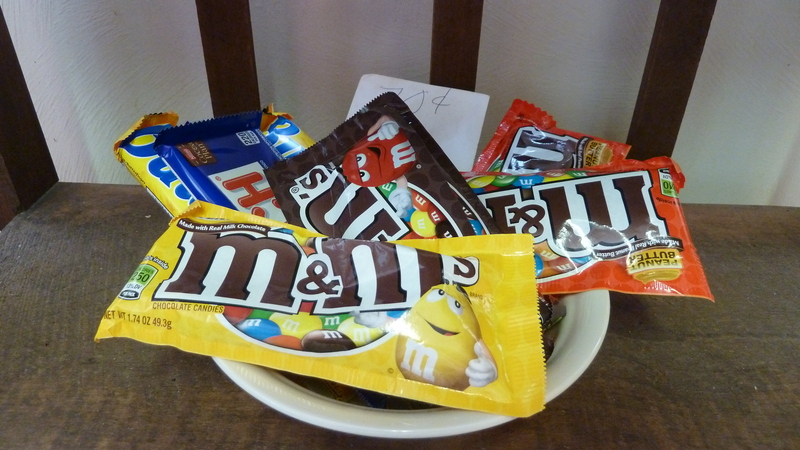 See the little yellow guy beckoning on the Peanut M& M package? Yes, that. Rather than indulge, I quickly snapped a photo to keep myself from eating that just-right- combo-of-salty-crunch-and-savory-sweetness right then and there. But I was tempted. Can you tell? And I had already cheated. I made yellow-cake chocolate-frosting cupcakes for my husband’s birthday two weeks ago, which of course I had to eat too lest he think I was poisoning him. So I squeezed by on that pecadillo by rationalizing it was just frosting and not really chocolate as in candy so it was ok.
A couple days ago, blogger Jennifer Murch confessed (on Facebook) her weakness for red licorice, which I quickly jumped on and admitted my cravings for the red sugary high. I was somewhat comforted and amazed regarding the number of us who were eager to confess right then and there on Facebook our addiction to licorice. Talk about not a private confessional booth. Giving something up for Lent of course is not the important part. And these are all light duty sins–“sinlite?”: chocolate, coffee, licorice … the real tempter must get a kick out of seeing all of us light duty Christians running around during Lent obsessing over giving up Facebook and Peanut M & Ms. Giving up something is to help us take up other disciplines and use the time or money saved for better causes. To pray earnestly every time our temptation beckons–not for strength to fore go chocolate, but to look inward and weed out the pride and jealousy and laziness we see there. To pay attention to the niggling lusts and materialism and better-than-thou-ism that would lead us astray. I also need to pay attention to what happens to my faith when the biggest sacrifice I can think of is Peanut M&Ms. Or giving up Facebook on Sundays. How easily we rationalize our sins–an easy step to take when we’ve practiced rationalizing how chocolate frosting doesn’t really count as chocolate candy. God be merciful to me a light duty follower of the Christ who willingly gave up his life in the cruelest most inhumane death imaginable. Today pumped up athletes beat their chests when they’re all braggy and talking trash to the other team. When did that powerful symbol of deep despair get turned around anyway? I’m now reading Tullian Tchividjian’s book One Way Love: Inexhaustible Grace for an Exhausted World which gives plenty of hope for sinners like me (us?) in need of mercy. Are you a MennoNerd too, Melodie? Sounds like an interesting book. We all need grace for sure. Yes, I signed on pretty early, after I wrote about baptism last year. I’m not sure my posts always fit the Mennonite/Anabaptism focus but I guess it offers variety.